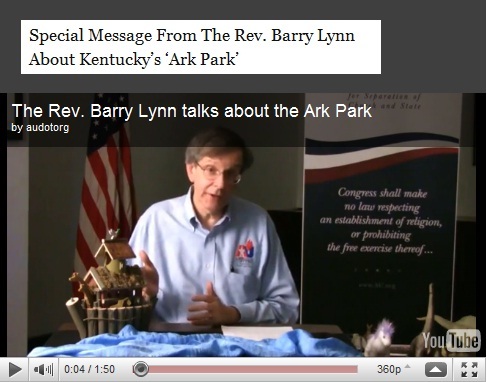 Recently, the kind folks at Americans United for Separation of Church and State sent me an email telling me about a special message from “Rev” Barry Lynn concerning the “Ark Park.” I never asked to be signed up to their spam feeder; I simply asked them to verify the “reverend’s” credentials and beliefs… and they added me for spite. Perhaps God works in mysterious ways because the YouTube video message was priceless! Here, he indicates a Biblically-inaccurate Nursery toy version of Ark, the kind that Answers in Genesis and other Biblical Creationist organizations regularly warn us about. Why? Because this silly pint-sized icon, however incorrectly it reflects the actual Biblical account, gives kids the impression that the Bible is a book of fairy tales and, as a result, causes them to doubt God’s Word. 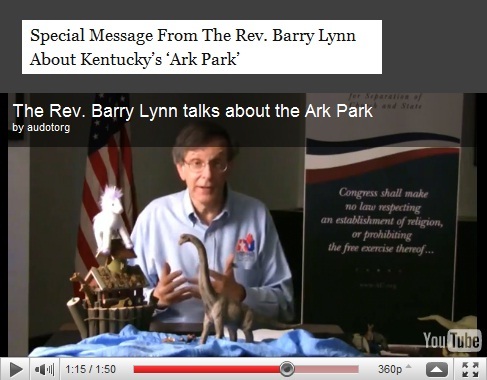 In other words, he points to the very false icon that the Ark Encounter is meant to combat! “Some people believe there really was a worldwide Flood. Other people say this is a fairy tale and some people say it’s a good story to show that humans should respect the Earth. It’s likely that the latter view is taken from a misappropriation of the meaning of “and the earth was filled with violence” [Genesis 6:11-13] Note that the passage doesn’t refer to violence against the Earth, but violence that filled the earth. Man’s wickedness is the specific reason God gives for decided to send the worldwide Flood the “rev” Barry Lynn doesn’t believe occurred. This is America. We can believe what we want, but down in Kentucky it appears Noah’s Ark has veered off course. The government has decided to help pay for construction of a Noah’s Ark water park. Of course, it’s not really a water park, but the “rev” intends not to inform but to mock by mischaracterization. Nor is the Kentucky government funding anything. Rather [and Barry has been corrected on this point several times, but he's apparently not one to let the facts stand in the way of a good story... or a liberal, and unBiblical agenda! ], the Ark Encounter will receive a tax rebate IF they meet a certain sales objectives in the first year. Absolutely ZERO funds are going toward building the attraction. The “rev” Barry knows this and he’s lying about it anyway because he’s a godless unsaved liberal who cannot even affirm the bodily resurrection of Jesus Christ [a key element of saving faith per Romans 10:9]. The people who are building it say it is a ministry to convince visitors that God created the Earth just 6,000 years ago. The very thing this false minister fears is that it will convince folks that the Bible is true. he’s been saying it’s only partly true for years. That would certainly affect his credibility. They did the math, just like that guy who predicted the end of the world last month. Ah, a cheap shot. Unfortunately, if Barry had read his Bible, taken into account the Biblically given dimensions of the Ark and the implications of the term “according to their kind,” and bothered to do the math himself, he wouldn’t be misrepresenting a Nursery School ark toy as the real thing. His allusion to the shamelessly unrepentant Harold Camping is just bad rhetoric; Camping has ignored Jesus’ thrice-quoted warning against date-setting and is destined to be thrice-shamed on October 21, 2011. But this is beside the point and the “rev” knew this when he introduced his comparison of apples to oranges. 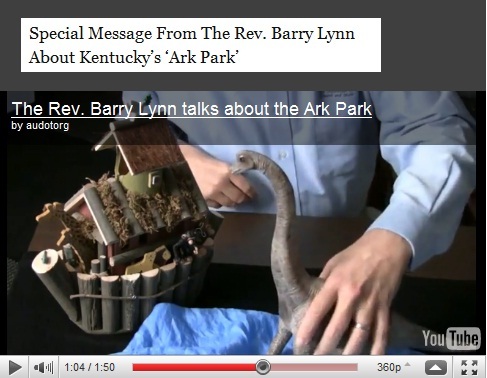 Here he emphasized his point by placing a toy dinosaur next to the toy ark. It obviously dwarfed the Biblically inaccurate Ark. This is yet another reason why the Ark Encounter will be so effective in dispelling the toy ark icon that evolutionists so love to pick on. Of course, when you misrepresent your opponent’s beliefs in this fashion and then tear down this position they do not hold, you’re thatching together a straw man. Your opponent’s actual position has been left quite untouched. For the answer to how dinosaurs fit on the Biblical Ark, see How Could Dinosaurs Fit On the Ark? So now we’re subsidizing bad science as well as religion. If Biblical Creationism is such bad science, why does Barry have to resort to lies, mockery, bad rhetoric and propaganda in order to combat it? Just sayin’. I’ve got a better idea: make a donation to the Ark Encounter. If you do, you’ll help shatter the toy Ark icon that causes our children to doubt the veracity of God’s Word and help build the faith of future generations in the truth of God’s revealed Word. As an added bonus, you’ll make “rev” Barry’s worst nightmares come true, for when the Ark Encounter is built it will show his lies about subsidies for what they are.